It is often difficult as individuals to confront the overwhelming global problems, the big ones we feel too little and powerless to do anything about. But at the first annual Heirloom Tomato Tasting and Salsa Contest at Earthly Delights Farm in Boise, the mood was anything but grim. Dozens of people gathered together in the crisp sun of a late summer evening to celebrate something that’s been quietly slipping away for generations—agricultural biodiversity. In this case, an astounding variety of tomatoes. 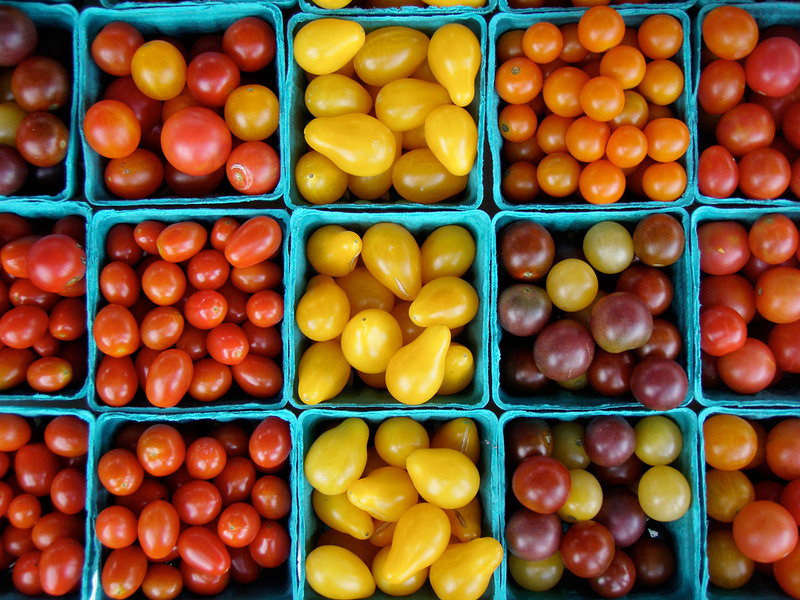 While a grocery store might have one or two kinds of tired-tasting tomatoes even at the height of tomato season, area gardeners and farmers arrived in cars and on bicycles, schlepping boxes, bags, and napkins of homegrown precious cargo, plucked straight from the soil hours before. Fat, dripping pink Brandywines and speckled, gooey gold and red Hillbillies took their place at the tables alongside tart Green Zebras and striking black-and-orange Indigo Rose. Tiny Red Currants and picture-perfect Cherokee Purples lined up next to dusty-lush Black Cherries, all of them splaying their flesh for the delighted tasters in a smorgasbord of juices and smells and flavors dancing wildly on tongues as we grasped, many for the first time, the sheer and simple pleasure of tasting an abundance of unadulterated, homegrown tomatoes. Of tasting a mind-boggling diversity of any common vegetable, really. Varieties kept coming, brought by the hands that have lovingly tended them. The bell-pepper-like Striped Stuffing, with thick walls and hardly any juice, gorgeous red skin streaked with orange. The almost grotesque-looking Green Sausage, mimicking its namesake in a green and yellow, bulbous tube. Perhaps most exciting were the Idaho heirlooms—varieties kept alive by Idahoans for generations, brought with their ancestors through countless epic journeys, the seeds carefully planted out and saved year after year by descendants and neighbors, creating a living, edible, local history of sorts. The Rockin’ R Ranch Roma tomato, stewarded by the Edwards Greenhouse family. The Payette tomato, a wonderful, stout little determinate plant with early maturing fruits. Over 100 varieties of tomatoes found their way to our tiny urban farm that day, each the result of a line of careful gardeners who have cared for its seeds over generations. A remarkable feat by any calculation, but considering that 94% of the vegetable varieties available at the turn of the century have been lost, it becomes almost radical. As small seed companies continue to be bought out by large corporations, our agricultural biodiversity shrinks proportionally. Our public plant breeding programs give way to breeding for industrial farming—for long-distance transportation, not taste. For chemical agriculture and a steady supply of synthetic fertilizers, not for resilience and organic systems. For the ability to genetically modify. If we want to develop secure local food systems, we must begin with locally-adapted seeds, since seeds are the headwaters of agriculture. No seeds, no food. The larger the diversity of seeds we have, the better chance we have of producing food on our ever-unpredictable and changing earth. The Irish potato famine that caused the massive starvation and emigration of an entire people tragically demonstrates what happens when we rely too heavily on one variety that succumbs to disease or climactic pressures like drought. By keeping biodiversity alive, we increase the chances that some of our crops will make it through a pest or disease infestation, a long summer drought or a harsh winter, even while some fall victim. And by doing it locally, we’re developing varieties that love our climate and soils, that will work here even when seeds brought from other places fail. It turns out, little farmers and home gardeners are not powerless after all. In fact, we’re quite the opposite. Small farmers and gardeners doing what they love to do are the solution to the huge, intertwined problems of loss of biodiversity, corporate-contolled agribusiness, and global climate crisis. As writer Michael Pollan says, “Food is one of those rare arenas where the ethical choice is also the one most likely to make you groan with pleasure.” By growing out and saving seeds off our favorite garden plants, we not only enjoy the personal empowerment, the abundance, and the increased self-reliance of the work, we actually help the entire world. That’s not what was in the forefront of the minds of the tomato tasters that day, though. It didn’t need to be. In freeing ourselves from the “tyranny of the tasteless tomato,” in writer Guy Hand’s words, we succeeded in some small part in making that broken system totally irrelevant. Our eyes, tongues, and bellies stood witness to a breathtaking array of delicious food, grown by our neighbors and friends, in a simple evening of great pleasure and abundance. Thank you to all who participated, and to all who participate every day by growing good food and saving seeds. What a grand life! This entry was posted in Uncategorized by casey. Bookmark the permalink.